It started the way it always did. I sat up in bed, unsure of what had woken me. My first thought was the new family who had moved in upstairs. Rowdy, Dad called them, amongst other things. Not even a month since they'd arrived and they'd managed to upset everyone, crashing up the stairs at all hours, swearing, slurring and burping. This book blew me away. Once I began reading it, I just couldn't put it down. Michelle Harrison is excellent at hiding the truth from you until she is ready for you to hear it. There were elements that I really didn't see coming and I really should have. The story builds at a slow pace, which adds to the tension as you become desperate to find out what is happening to Elliott. As the book progressed, I had to finish reading it in daylight, as some of the scenes really did freak me out. Past Lives, a living and working museum really came to life for me.The author made the village accessible to her readers; I felt I could walk down the streets and be able to name all the buildings and which ghosts haunted them. I have visited a similar museum and I really felt Michelle had captured its essence in exquisite detail. Elliot was an excellent character, right from the start you want him to discover the truth and learn to deal with everything happening to him. He wasn't perfect and I think that is why I liked him so much. Before his accident, he really had been one of those boys your mother always told you to avoid, yet the accident changed him, opened his eyes and his emotions to the world. You could see how he looked up to his brother, yet he soon realises that the people you love the most are not are not infallible. The blossoming romance between Ophelia and Elliott was beautiful, yet edgy. Each hiding a difficult past they still haven't learnt to live with. They both have flaws, neither one perfect, yet they still fell in love with each other. The scenes between them were quite breathtaking. 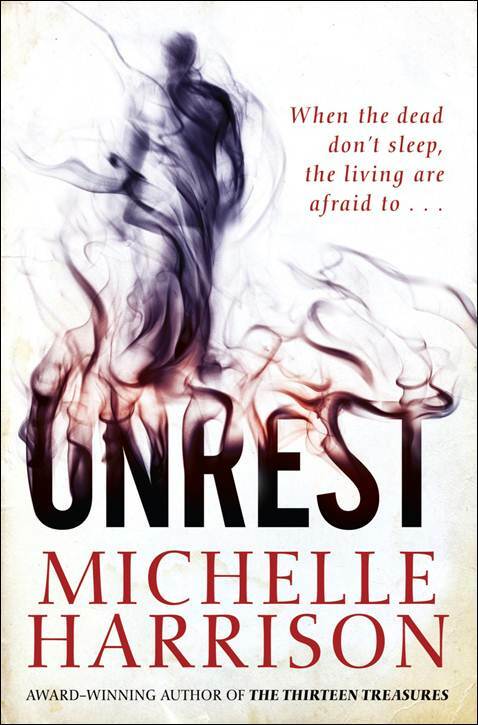 There is something very British about they way Michelle writes, no fancy and far fetched ideas, the writing is realistic and gritty. Certain scenes in the book really creeped me out. If you love programmes such as Most Haunted you will love this. I think Michelle Harrison has easily shown that she is capable of taking on the YA market as well as the children's genre. She has created a spine tingling spooky tale, guaranteed to give you goose bumps. Michelle Harrison is always at the top of my list of recommended authors; she writes with a voice that entrances you; gently leading you away from what you are supposed to be doing and losing you in the story. A modern day Pied Piper! This book has been written as a standalone, but I do feel there is room for a sequel. I want to see Elliot's abilities grow over time; I want to see where they will lead him. I am also a sucker for romance and I definitely need to find out what happens with Ophelia and Elliot as life throws a few more obstacles in the way. If there isn't a sequel, I may petition!